Engage Leeds, a support service which helps prevent people from becoming homeless, has helped in excess of 3,000 people across the city since setting up just over 12 months ago – but the issue of homelessness continues to worsen, with a recent report showing that rough sleeping stats have risen for the second year in a row in Leeds. To help tackle this, Wates Construction is utilising its position as the lead contractor on 7&8 Wellington Place to launch a pilot scheme which aims to provide vital employment to individuals with no permanent abode, or those deemed at risk of losing their home. The scheme, supported by the site’s developer, MEPC, will offer full time, site-based paid work to those in need. Working with local housing support service, Engage Leeds, Wates and MEPC recently welcomed its second new team member to the 7&8 Wellington Place site as part of the ground-breaking pilot. The contractor and Engage Leeds will now continue to work together to make further appointments as the project progresses. The site team is also undertaking a range of other activities to tackle homelessness in the city, including volunteering at St. George’s Crypt homeless shelter as part of Wates’ annual Reshaping Tomorrow Week. This summer, construction workers implemented a ‘pay it forward’ programme in the Crypt canteen, with money donated to buy food vouchers. These were then distributed to homeless people across Leeds, enabling them to enjoy a three-course meal. Paul Dodsworth, Business Unit Director, Wates Construction, North East and North West, said: “There has been a noticeable rise in homelessness across the UK in recent years, especially in major cities such as Leeds. As a company with a large local presence, we are determined to use our work on projects such as 7&8 Wellington Place as a force for good, and to do what we can to prevent the further rise of homelessness. When complete, the 378,000 sq ft. of Grade A office space at 7&8 Wellington Place will house HMRC’s new regional hub for Yorkshire. 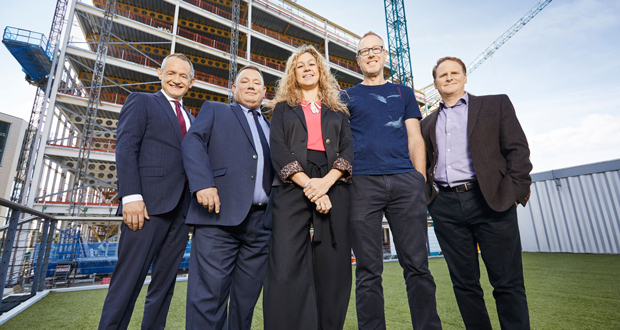 Scheduled for completion in 2020, the 6,000 civil servants that will occupy the new government hub will be welcomed to Wellington Place’s thriving business community, one of the largest and most prestigious new city centre business quarters in Europe. The contract adds to Wates’ portfolio at the commercial development, which includes the completion of buildings 3, 5, 6 and 10 Wellington Place.